According to a research, 75 million adults in America are suffering from high blood pressure. It also means that every 1 in 3 people has hypertension which is a serious issue. To regulate blood pressure, various measures have been taken and medicines have been introduced. People try all types of tricks and strategies to lower their blood pressure down. At first, when you find out that you also have the risk of high blood pressure, you think of all the possible medications, exercises etc to control it as soon as possible before it becomes more dangerous. There are also some herbs which are extremely beneficial in keeping your cholesterol level down and maintaining a healthy and balanced diet. Also Read: How much are you aware of blood pressure? Ginger: Ginger is also called a “smart man’s aspirin”. It is a vigorous remedy for blood thinning. It also acts as an anti-inflammatory herb to significantly reduce the blood pressure. It is helpful in improving the blood circulation by relaxing the muscles that surround the blood vessels. You can chop, mince or grate fresh ginger into various dishes like noodles, tea and other vegetable dishes. There are also ginger capsules available in the market that helps to regulate the blood pressure in the body. Cardamom: Used mostly in South Asian food, cardamom is a great remedy to significantly decrease systolic and diastolic pressure. It also increases the clot-inhibiting property due to which the smooth flow of blood takes place and no clot is formed. The Indian Journal of Biochemistry has conducted a study in 2006 which stated that patients who were suffering from high blood pressure have shown an amazing drop in their blood pressure level when they were given cardamom. It has been originated in India. You can include it in soups, or sweets. It has a great fragrance that enhances the taste of food. You can also give a special flavour to baked food items. It would be helpful for your health as well. Basil: It is a great herb for adding essence to the food items as well as getting your systolic and diastolic pressure under control. Basil has a high amount of Vitamin K and calcium, antioxidants oils, it offers great benefits in controlling the level of stress. Though it is effective for a short span, still it gives great results. Basil leaves are added to a variety of food items to make them flavoursome as well as increase the nutritional value of the food. You can add the leaves to soups, pasta etc. Cinnamon: A recent study conducted by The Journal of American College of Nutrition in 2006 have shown that people who are suffering from high blood pressure have shown drastic changes in their blood pressure level after the consumption of Cinnamon. It is one of the other delicious spices that lowers the blood pressure by managing the blood circulation inside the body. You can sprinkle it in your daily meal like oats, cereals etc. You can also add cinnamon to your coffee. It is mostly used in Asian food for improving the flavours of the curries, stews etc. Flaxseed: It is rich in omega-3 fatty acids which are helpful in improving the blood pressure.It improves glucose intolerance and acts as an antioxidant. It also helps in improving the cardiovascular activities. It effectively reduces the risk of stroke and heart attack. It improves the cholesterol level in the body. It can be stirred to any dish. You can add it to soups, smoothies or baked food. Most of the herbs provide anti-inflammatory properties that are natural forms for lowering the blood pressure. 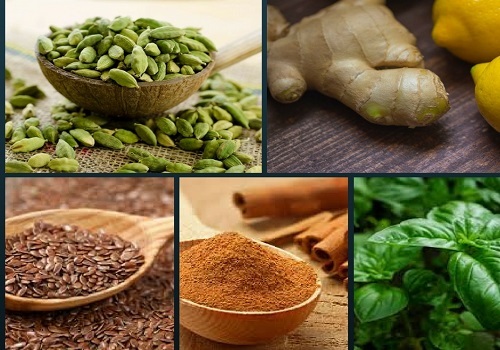 The herbs are cheaper and healthier way to get your blood pressure level under control. If you are taking herbal supplements, that does not mean that you need to stop taking medicines. What are 5 wholesome grains for diabetes? How much are you aware of Blood Pressure?